This list includes a number of above-average figures. You will therefore certainly redundant in a majority of your games. This is an advantage that it will operate. However, as 4 of your figurines are on multi-figurines cards next activation, the list is just a bit more … In order to keep the advantage of numbers it will therefore play your militiamen wisely (which are on multi-figurines cards ). Upon activation Lancers for example, you generally have 4 AP (Action Points) to you to manage at best depending on what comes up, one of lancers harass an opponent while the other could play the scenario. The other point that is going to require particular attention is the placement of decorations and deployment of your archers. Indeed with a reach of 30 inches they can take over the entire table (unless they recover completely in a corner, and again, some areas will not be accessible with their arrows). Obviously, potential shooting across the table is diminished by the decorations that will block line of sight: it is for this reason that we must think carefully about when to lay the early game. You will also discover that list with an offensive alchemist unlike many formulas that provide a bonus for his troops, the Jade Triad has more offensive forms. The Achimiste Long Sigh will enable you to lose valuable PA to your opponent. Captain Lee Ping is a safe bet with correct damage table and above his competence “skip”. It will further be assisted by a terrible shadow of the guard with his Cobra damage inverted table can wreak havoc and come complete an opposing figure. Finally generalities, do not underestimate the good position that Chinge can save one of your main pieces (Lee Ping example) thanks to its jurisdiction “Guard”. We’ll have to use the advantage of the number of figures for activations although there is a risk that your opponent has more, or at least as much. This is not your archers who will play the scenario (a priori), they will be satisfied by being well placed to harass the opponent at bay. For multi-card figures, it is rather the lancers who could play goals if necessary. But if your opponent has few figures with the skill “Lie” it will be better to use these Lancers to fight because opponents can not respond to their calls. In this case, it will take on Lee Ping, and Shadow to the objectives of the scenario. Your Chinge, although it can also participate in the scenario or retrieve components, will instead be used to its jurisdiction “Guard” that will allow you to protect your eg Chef Lee Ping of an opposing load. Once the figures set by the lancers, weakened by archers or placed on the ground by the alchemist, Lee Ping can come to clean or gently play the scenario. The Shadow? Yes, I have not yet placed in the game list … Because she’s pretty “solitary”. Stealth that the opponent will have to spend AP to approach if it wants to charge. On top of that, it can come from the back of a backdrop with its jurisdiction “Bond”. If you combine all that with its speed of travel, you will understand why it is rather lonely and may come knocking here and there at will, as needed. Its reverse damage table and reflex score, combined with an attack “Fast”, make it a formidable burden. Caution, however, there is a downside, though having a good defense, it has only “very few” hit points … and could be neutralized very quickly. Shadow should be used for surgical strikes. Whether Lee Ping or Shadow, their range is large enough, they can obviously play goals of the scenario when an opportunity arises. Militia-lancers: Once the figures set by the lancers, weakened by archers or placed on the ground by the alchemist, Lee Ping can come to clean or gently play the scenario. 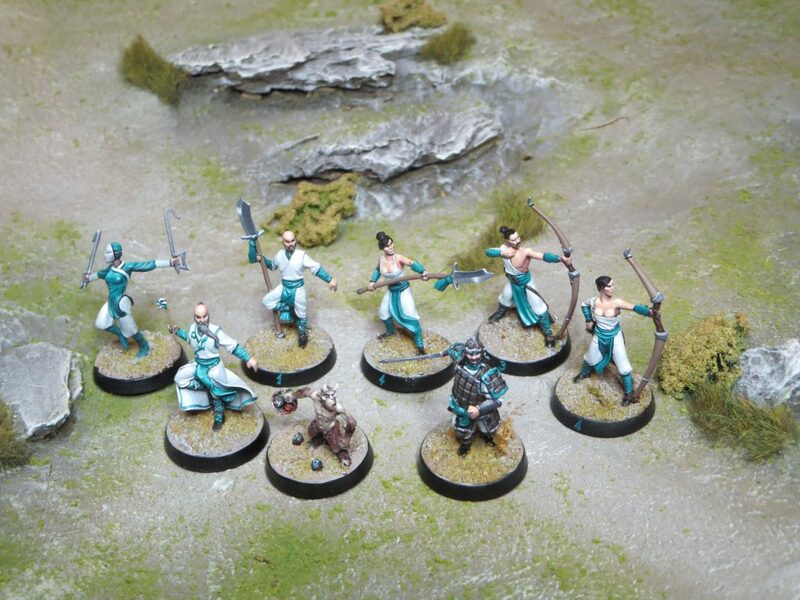 Militia-archers: They are also part of your basic troops. Their role is to weaken the opponent with their shots. For this positioning sets and their deployment should be well calculated. Chonkey: The figure is generally quite low, with few points, a poor defense … but it will allow you to save one of your key figures with competence “Guard”. Shadow: A figure not so obvious that it to play. It must intervene at the right moment to come complete impaired figurines; well placed, it will play perfectly his assassin role. It can also be used to pick up distant goals through its speed. Lee Ping : Your hero … As with all heroes, we must watch over him especially early in the game to prevent it is too soon in trouble. Its jurisdiction “skip” associated with his good attack value will make him a lot of damage to opposing teams. Its movement is rather “weak”, but his 4 PA enable it to have still a good range and playing the objectives of the scenario.